Set Up: Players get in pairs with one ball between them. Gates are set up half way and are 2-3 yards wide. Activity: Players start 10 yards on either side of the gates, and strike balls to each other. As players get accustomed to accurate passing, they back up. 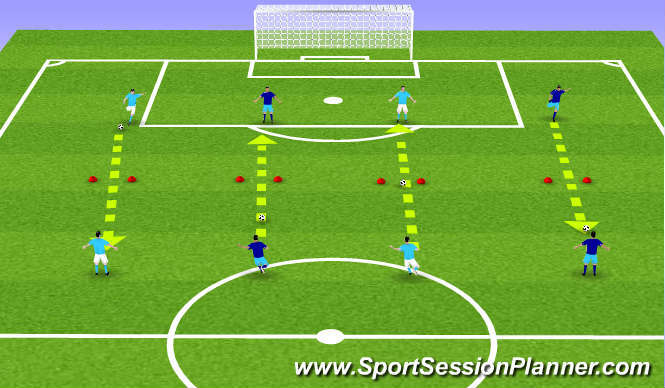 Goal is to have them reach 20 yards on either side of the cone and strike balls with accuracy. Coaching Points: Driving a ball with the laces, plant foot facing target, tall and strong through strike, follow through towards target, prepare the ball with a good first touch.